Leaders at Mauritania meeting vow to "defeat terrorism" and back French bid to relaunch Israeli-Palestinian peace talks. 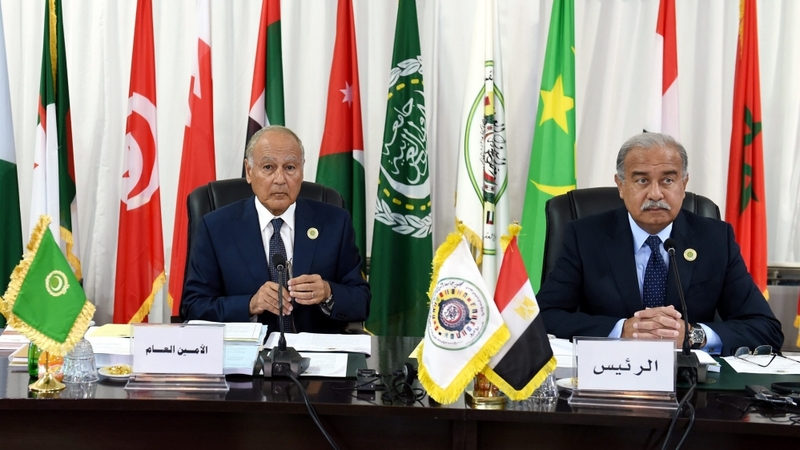 Arab leaders, speaking at the opening of the Arab League summit in the Mauritanian capital, have pledged to "defeat terrorism" , with the ongoing threat of violence in the region dominating the agenda. Chaired by Mauritanian President Mohamed Ould Abdel Aziz, the two-day conference opened on Monday inside a large tent in Nouakchott, with the crises in Syria, Iraq, Yemen and Libya the main focus of talks. Sherif Ismail, Egypt's prime minister, was one of the first of the 21 leaders to speak and blamed foreign intervention in the region for the rise of groups such as the Islamic State of Iraq and the Levant (ISIL, also known as ISIS) and for the radicalisation of young people. "Foreign intervention in Arab affairs is one of the major reasons for the current crisis, therefore we should work together to cement our domestic fronts in order to be able to stand up to these foreign interventions," Ismail said. Yemen's president called on his country's Houthi fighters to surrender their weapons and withdraw from territories they control as Arab coalition air raids continue to strike the armed group's positions. Abd-Rabbu Mansour Hadi, who has fled the Arabian Peninsula country, called the continuation of air strikes "a spark of hope". "The only solution to the crisis is for the [Houthis] to abide by the recommendations of the Gulf Arab initiative and UN Security Council resolution 2216 which calls for them to withdraw from areas they seized and lay down the heavy arms they have," Hadi said. Five Saudi border guards were killed on Monday in clashes with armed groups seeking to enter from Yemen, Saudi state TV Al Ikhbariya reported, citing the Saudi interior ministry. A ministry statement said the border guards detected attempts by "hostile" armed groups to cross the border on several fronts in the southern region of Najran on Monday morning. Eight hours of clashes ensued. The statement did not identify the armed groups, but Saudi forces and Houthi fighters have traded fire across the border. About 9,000 people have been killed in Yemen since the intervention began last March, the majority of them civilians, according to UN figures. The fighting has also driven 2.8 million people from their homes. For his part, Adel al-Jubeir, the Saudi foreign minister, addressed the conflict in Syria, saying there could be no solution while President Bashar al-Assad was still in power. "Thousands have been killed and millions displaced in addition to the destruction of the infrastructure of the country, as a result it is impossible for Bashar al-Assad to have any place in the future of Syria, especially since his hands are tainted with the blood of his own people," he said. Arab leaders also voiced support for a new French initiative aimed at relaunching Israeli-Palestinian talks and holding an international conference for peace by year end. "Putting an end to Israeli occupation and establishing an independent state of Palestine with east Jerusalem as its capital will always remain the prime focus and purpose of the Arab world," Ahmed Aboul-Gheit, the secretary-general of the Arab League, said. "The stand taken by Israel continuing its illegal settlements requires us to find new and creative proposals to ... achieve peace. This requires us to take advantage of the recent momentum ... about the implementation of a two state solution."